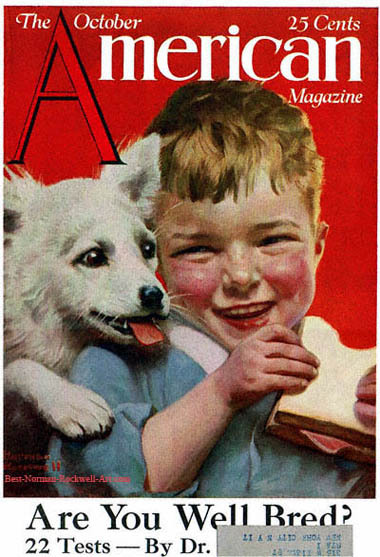 Laughing Boy with Sandwich and Puppy, this Norman Rockwell painting, appeared on the cover of American published October 1921. This was the fifth picture by Rockwell to appear on the American Magazine cover. American Magazine published only seven covers illustrated by Rockwell, between 1918 and 1923. Most Likely, the smaller magazines desired Rockwell's signature and art on the cover to provide a boost in newstand sales. The artist was already very popular by the time this cover appeared. The original oil on canvas painting, 10 x 8 inches or 25.5 x 22 cm, is part of a private collection. This painting also appears in two Rockwell commentary books. It appears on page 74 of Norman Rockwell: Illustrator by Arthur L. Guptill and on page 7 of Norman Rockwell, A Definitive Catalogue by Laurie Norton Moffatt. What else does a boy need besides his best friend and a great snack? This boy is clearly overjoyed at his lot in life. He is eating a sandwich for lunch. It looks like a good sandwich, too. It is made with white bread and a big enough slice of ham that it actually protrudes out from between the bread slices. He has only taken a few bites when his little white puppy dog comes to join him. The puppy is hungry, too. The puppy is probably accustomed to eating table scraps for his meals. So a bite from a sandwich naturally seems normal to him. Ah, but the boy realizes the puppy is reaching for a bite. He turns away just in the nick of time. The puppy's actions and his fur tickle the little boy. A laugh ensues. I would almost bet that the next frame would show the boy sharing his sandwich with his best friend. Do You Have A Great Story, Opinion Or Contribution About Laughing Boy with Sandwich and Puppy?